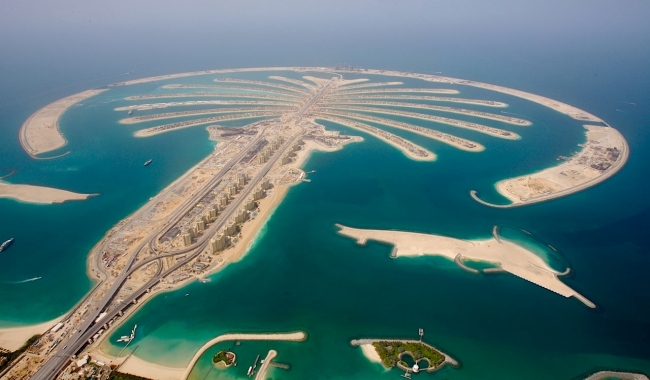 The best way to visit Palm Jumeirah is to take a taxi to the Palm Gateway Monorail Station, at the base of the Palm, and then the Monorail up to the the top, where most of the attractions are (Atlantis hotel, Aquaventure Waterpark, The Lost Chambers Aquarium... ). This way you can enjoy the view of the Palm from the elevated train. 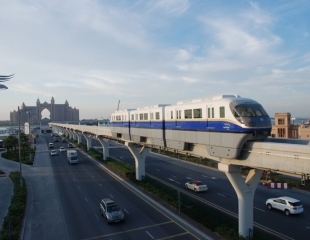 Instead of taxi, you can take the Metro, but Monorail is not yet connected to Metro (there are plans for the future), so you will have to walk 10-15 minutes from Dubai Internet City metro station or, again, take a taxi for the rest of the way. If you choose to walk, be careful following directions from the locals, because the whole area is changing rapidly and most of them are really immigrants, so they don't really know. Also, there is a free Shuttle Bus from a few hotels and from Ibn Battuta Mall (drop off is at the Welcare Clinic entrance in China Court and pick up is at the Battuta Gate Hotel entrance at Egypt court). Once you get to the the Palm Gateway Monorail Station, be prepared to wait up to 20 minutes for the train to arrive. This shouldn't be too troublesome since the stations are quite new and clean. The journey takes about 10 minutes in one way. There are 4 stations along the route, but the middle two are not yet in use, so don't be surprised when the automated train stops there, but the doors don't open. Alternatively, you can skip the monorail and take a taxi the whole way. The advantage is that the taxi can take you for a ride on the Palm leaves, where the monorail doesn't go, but don't expect to see much from there, because the villas block the view. Generally, the view from monorail is much nicer, since the monorail travels a few meters above the ground. 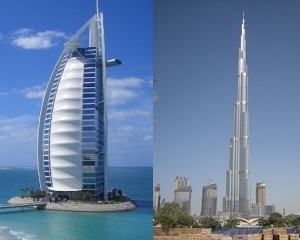 The best compromise could be to take the Monorail only one way (saving AED 10) and take a taxi for the return trip. Additional reason for this is that on your way back, when you exit the Monorail on the last station, there can be a problem getting a taxi there. Be aware that you can't enter Atlantis hotel if you are not a guest. If you want to visit one of the many hotel restaurants be sure to book in advance. 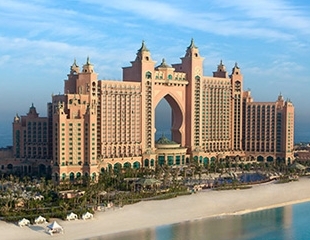 Aquaventure Waterpark, The Lost Chambers Aquarium and Dolphin Bay are available to the public, but charge entrance fee. The elevated monorail offers some very nice views of the the Palm, the city, and even the nearby Burj Al Arab hotel, especially when approaching the Atlantis hotel, when the road goes through the underwater tunnel and the monorail travels above the sea, offering a spectacular view of the hotel. However, don't expect to see the palm shape - for that you need to be much higher. The train is fully automated, without a driver, and costs AED 25 for a return ticket. Private villas are located on Palm leaves. They are built in two rows, with a road in the middle, so that every villa has direct beach access. 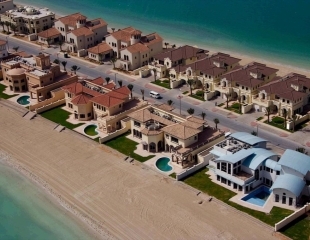 The villas are available for sale, for an average amount of AED 13 million (cca USD 3.5 mil), and also for rent. Driving down the road between villas, don't expect to see much, because the villas block the view.